Go Now is an early single Bristol set TV drama from acclaimed director Michael Winterbottom. 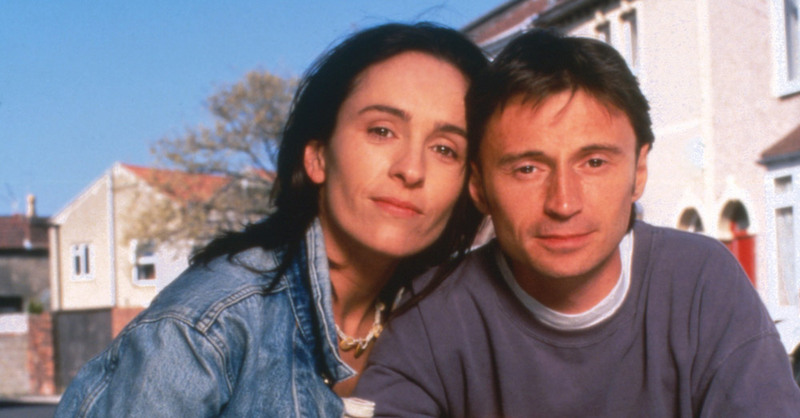 In a script co-written by Jimmy McGovern and Paul Henry Powell, Go Now stars Robert Carlyle in a performance of barnstorming power as a construction worker and pub-team footballer Nick Cameron who discovers he is suffering from multiple sclerosis. The film deals with how the illness impacts on his friends (including an early smart-mouthed and often scene-stealing appearance by James Nesbitt) and family, specifically his girlfriend Karen (Juliet Aubrey). In many ways the film is a very simple story of how self pity and frustration can cause misunderstanding and resentment between people who are just trying to help. It’s a will or won’t they stay together tale – will Nick’s illness ultimately break up his relationship through his own deliberate belligerence? A key moment centres on Nick berating his group of laddish mates for treating him with kid-gloves. He’s no different in his head, just unable to use his body in the same way he could before and doesn’t want looking after, despite the fact he desperately needs the assistance. The cast is uniformly excellent, with Juliet Aubrey as Karen providing most of the emotional centre. Being made in 1995 the laddish aspects of the script seem the most glaringly different. This bunch of boozing footballing friends are depicted essentially harassing women with reactions from the women which these days just seem hugely inappropriate; it seems very unlikely a group of nurses in a hospital would welcome being catcalled by a bunch of bantering lads in the way it’s shown in the film. It oddly dates a story which seems otherwise remarkably fresh. The simplicity of story means that the script, direction and performances are brought into sharp focus – they have nowhere to hide. It’s a good job they are all very good, in lesser hands it would not be as satisfying. There is a lot of humour in the film, and although it’s not a miserable experience, the depiction of the ravages of MS on Nick throughout is very sensitively dealt with unsparingly. The pacing of the piece alongside the behaviour of the characters does mean that the sympathy with them changes throughout. There is a complexity to what is happening under the skin of each of the characters which is very well handled. Also the framing device of speeches being made at an event which is only revealed at the end of the story does provide some extra tension which is only resolved at the end. It adds an extra and welcome narrative drive, even if at the end the audience is left slightly wanting; the conclusion almost seems to arrive too quickly. Go Now is out on DVD from the 12th September. It is release by Simply Media, who are donating £1 from the sale of each copy to The MS Society UK. And Trip-hop completists may be interested to know Tricky makes a guest appearance as himself.